Olivia Giacobetti’s fragrances have a distinct voice—clarity contrasted with darkness. The aura of her creations is a haze over the rising morning sun, radiance shining delicately through the mist. Préparation Parfumée is not an exception in this respect. Created in 2001 in collaboration with interior designer Andrée Putman, Olivia Giacobetti’s fragrance joining the divide between masculine and feminine perfumes captures perfectly a scent of sunbleached wood. A touch of crisp sweetness is provided by a modest ornamentation by water lily, while the top notes are a whirlwind of the black pepper. Transparent and minimalist quality of the fragrance should in no way be interpreted as anything promising boredom, because one simply cannot be bored while basking in its misty, yet bright glow. 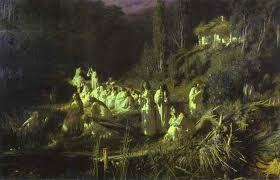 Painting (click to enlarge): Mermaids (Rusalki, Based on Night in May by Nikolai Gogol) by Ivan Kramskoy, 1871. Oil on canvass. The Tretyakov Gallery collection, Moscow, Russia. www.abcgallery.com. Robin: V, Beautiful review, as always. 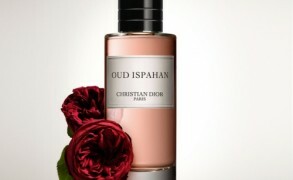 I love this fragrance. I do wish it was a little longer lasting on me. mreenymo: V, you write beautifully! I tested Preparation Parfumee a couple of years ago. It did not make much of an impression then, but your lyrical review got me thinking that perhaps I should test it again. Victoria: Oh, this sounds great! I am looking forward to it–rain accord sounds very much Olivia Giacobetti. I also wish Préparation Parfumée lasted longer, but it is such a beautiful composition that I do not mind reapplying or enjoying it while it lasts. Victoria: Dear R, It is a beautifully done minimalist composition, even though it is distinctly unisex. I am not sure how you may like that. For warm summer days, it is just the ticket for me. Or else, whenever I want to be reminded of the Black Sea! Jane Shearer: i am in london, where can i buy Andree putman perfume. i have just trek to the Conran shop where they use to stock it, but alas, no more. Please help, I need to get it NOW. 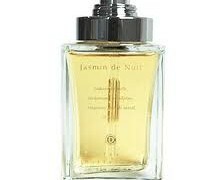 jean francois bernard: hi….i desesperatly looking to buy the preparation parfumée d andrée putman….i used to buy it in paris (but they told me they won t sail it anymore)…. i live in montreal…..